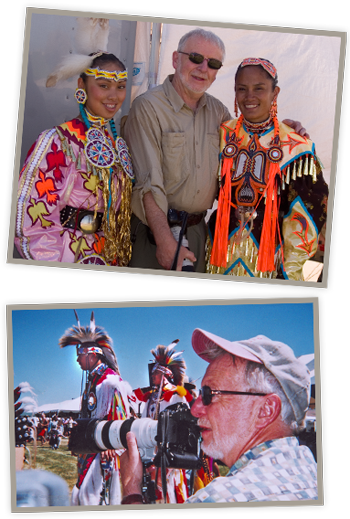 The team of Ben and Linda Marra created all the photographs in the Images along the Red Road documentary project on location at powwows throughout the United States and Canada. The Marras believe that they would never get the same intensity and quality if the dancers were photographed elsewhere. The powwow provides the magic. When the dancers step before the camera after dancing, faces glistening, the power of their pride and spiritual connection to those who have gone before shines through. Although the photos look as if they took hours to set up in pristine studio conditions, nothing could be further from the truth. The Marras have set up their portable studio in schools, gymnasiums, bingo halls, abandoned airplane hangers, smoke shops, and former racing dog kennels. 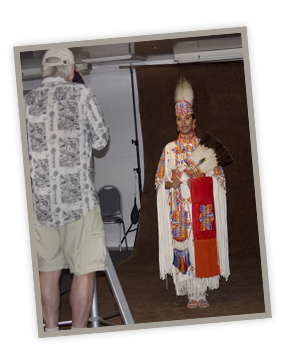 Linda strives to create a private and relaxed atmosphere conducive to the dancers’ concentration and records their stories along with names and tribal affiliations. The Marras’ flexibility, professionalism, and rapport with the dancers make the photographs work despite challenging conditions. 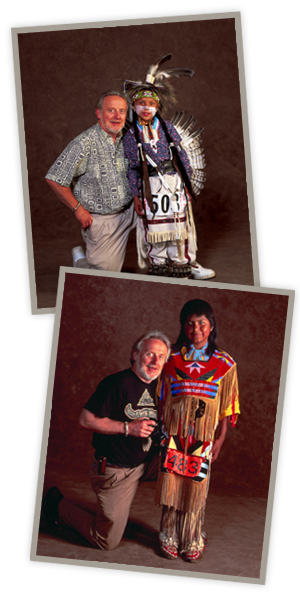 All participants receive high-quality copies of their photos for their personal use. All photographs are shot using Fuji Velvia film for its superior warmth and texture. "Your work is so very much more than nice photos, but it is truly unique art in the greatest sense of the word. I look at your photos and I get a feeling of inspiration or awe, something I don't know how to put it in words." "Thank you, Ben and Linda, for all your hard work. I am one who surely appreciates it. That's one of the reasons I enjoy being photographed by you - your generosity and sincerity and respect. "I thank you for this honor of taking my picture and making it look so good. It is the first time I have been able to see what others may see when I am dancing and may I say It Is Beautiful and Moving and I LOVE IT! THANK YOU."